Healthier people make good business sense. What does that actually mean? 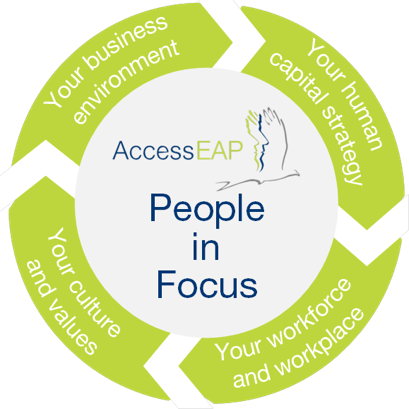 At AccessEAP we ask questions based on a number of "lenses" to look at your business. These different perspectives allows us to find out where your EAP needs to work the hardest and how we can make positive changes to your organisation’s culture. It's your EAP. You choose how you want it to operate and intergrate into your business. We believe that your EAP should be a strategic component of an overall workplace wellbeing program that engages and empowers employees, encourages early intervention and increases individual resilience to maximise workplace performance. We place your people at the centre and take a 360° view using a comprehensive framework to make complex workplace issues manageable.